The benefits of colloidal silver as a natural antibiotic are well known. In tiny amounts, colloidal silver is loved by the human body’s immune system because it effectively kills harmful bacteria. Colloidal silver (Also referred to as ionic silver) is a liquid suspension of microscopic particles of silver in water. The silver particles are invisible to the naked eye. Colloidal silver solutions are colorless, look like water and have no real taste. Silver has long been valued for its antibiotic properties for healing. he negative attributes of silver are that ingesting too much will case a harmless, but irreversible condition called argyria, which turns the skin a bluish gray color. The safety of small amounts of silver has been well documented by the EPA (Environmental Protection Agency). The guidelines for the safe limit of a daily intake of silver are called the Reference Dose (RfD). The RfD is specifically intended to keep the silver intake below any level that would discolor the skin. The EPA levels are so low that potential harm can only occur after ingesting an amount of silver that far exceeds the stated guidelines. Although there have been both claims that colloidal silver is simply a placebo at best, others hail its value as an antibiotic that supports the human immune system. A theory as to how colloidal silver acts as an antibiotic: The action of the silver particles seems to disable the enzymes in bacteria and even viruses, thus killing disease-causing organisms in the body. Silver acts as an antibiotic by effectively killing harmful pathogens. A study performed by the University of North Texas showed that colloidal silver (in vitro) effectively kills common disease causing pathogens. 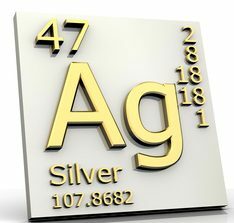 The interest in colloidal silver as a natural antibiotic is resurfacing both because of the rapidly increasing interest in natural health products and more importantly, because of the potentially dangerous advent of Multiple Drug Resistant (MDR) pathogens— microorganisms that are developing resistant to many antibiotics. Small particle size. Particle size should be about 10 ppm (parts-per-million. Go with a smaller ppm and take more if needed. Particle size of the silver is measured in nanometers or even Angstroms. This small particle size is the ideal uptake in your tiny cells since the cells cannot ingest particles that are much larger. One such producer of colloidal silver is Natural Immunogenic Corporation. They produce Sovereign Silver which both meets the above criteria and is the most highly recommended colloidal silver product world wide. Your colloidal silver solution itself should be totally clear. Avoid any solution that is amber or yellow-colored because that may be evidence that the particle size is too large or that the water is contaminated. Colloidal silver solutions are usually sold in light-protected bottles. There are how-to recipes and perhaps even kits promoting “make your own colloidal silver.” Unless you desire a permanent, blue complexion or have a state of the art medical laboratory to make it, buy your colloidal silver ready made. This way you will be sure to enjoy all of the benefits of colloidal silver. Since ancient times, the metal silver has been used for healing. Hippocrates, the Father of Modern Medicine, knew the benefits of colloidal silver. He taught that silver controlled disease. The medicinal properties of silver was used for such ailments as blood purification and heart conditions in the Middle East from about 702 through 980 A.D.
During the Middle Ages, the Black Death (1347-1351) ravaged Europe with death from bubonic plague. The aristocracy, sometimes referred to as “blue bloods,” seemed immune, thanks to the benefits of colloidal silver. The habits of the upper class consisted of using sliver plates. When scraping their food from the plate, they were ingesting both the food and silver. This ingestion of silver both caused their skin to have the blue-gray cast; a benign skin condition called argyria, but saved their lives from the plague that was rapidly killing many people in the lower classes. Since the widespread introduction of antibiotics (1940-1945), silver-based formulas were discarded, except for some topical silver salves, used specifically on burns, and neonatal eye drops. The FDA and colloidal silver are not exactly friends. The FDA has not approved colloidal silver as a means to diagnose, treat, or cure any disease. Companies selling colloidal silver products as a wellness supplement are not allowed to publish testimonies from satisfied customers telling the effectiveness of their colloidal silver product on a specific disease or condition. In 2002, the FDA issued the Dietary Supplement Enforcement Report that included colloidal silver on a list of “problematic” substances. This report stated that colloidal silver products have been promoted as an alternative to antibiotics. The report also says that colloidal silver is completely ineffective and cites that too much can cause argyria. However, this report from the FDA about colloidal silver fails to give any data to support those claims. In my opinion, it would be a service to independent thinkers and health minded individuals for the FDA to require safe dosing levels on labels for those who choose to enjoy the health benefits of colloidal silver.